The sixth edition, with fifty additional pages, is now available. Called an "occult religion" for adepts, a "creed of iron" for warriors, and a "secret society" for higher men and women who value "knowledge, freedom and power," the Odin Brotherhood honors the gods and goddesses of the Norse pantheon. This non-fiction book details the legends, the rituals, and the mysteries of an ancient and enigmatic movement. The book (ISBN 978-1-906958-63-3 (was 9781869928711 ) is available from Mandrake of Oxford, a British occult publishing house. An academic review of the book (by Dr. Sarah Pike of California State University) is available from Nova Religio. 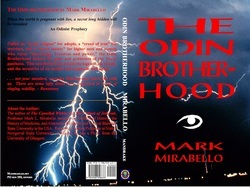 An interview of Professor Mirabello, on the Odin Brotherhood, for the Odin Lives Radio program, June 2004. WBCQ (International Shortwave Broadcast, Frequency 7.415) in Kennebunkport, Maine.